Look inside the book! Includes the Table of Contents and the complete text of Chapter One. Traditionally, we are taught that hard work, brains, and talent are necessary for success. But what if you are not really great at anything? Does that mean you have to settle for a life of mediocrity? Look around at the world and you will see millions of people sweating and working hard, but not getting anywhere. And intelligence is no guarantee of success either. There are plenty of unsuccessful smart people, and lots of talented people waiting tables. There IS an explanation for success, but it involves looking deeper at life, and combining the material world with the metaphysical. "I want you to know how great your book is! I have been aware of Esther and Jerry Hicks for years now (and Abraham), and your exposition of the Law of Attraction was the best I have ever seen...no exaggeration!" "Learning the ways of the universe has been a passion of mine for almost longer than I can remember. I think my first word must have been "why?" and the better portion of every day since has been spent in a quest to learn more. So suffice it to say I've read a book or two on the subject in my time. And many, I must say, have ended up being tossed across the room with a plaintive cry of disgust, with me feeling cheated for having spent money on either outright horse hockey or childish drivel. Not so with yours. It was not only well written, but left me feeling wiser and more powerful for having read it." Is it possible, do you think, for an infinite creation like the universe to operate randomly? If you ponder that for a minute you can see that in order for anything to work properly it must be well designed. The telephone has a number pad and a display that allow you to use it; the stove has dials to control the cooking temperature. All devices, in other words, have an interface that allows the user to communicate with the machine and direct its proper function. Inside the device, the components are hooked together in the most efficient manner! The universe is no different than your phone, computer, or household appliance, in the sense that it provides a way to interact with you in an intelligent fashion. It turns out that the universe has been designed to directly interface with your thoughts and your intent. If you are unaware of this user interface, however, you are like a person who tries to use a complicated computer program without having any idea how the menu's work! The Vibrational Universe describes the universe’s simple but powerful interface in clear, easy to understand language and with plenty of examples from real life. If you've ever listened to Abraham tapes and wanted more detail on how and why it all works, this is the book you need to read. "Honestly, before I read your book, I had read a lot of other books that basically put a band-aid on a gunshot wound; but your book wentright to the core of things, and ever since, my life has gotten better and better. I believe in my heart that a book such as yours is needed in the law enforcement & military community." 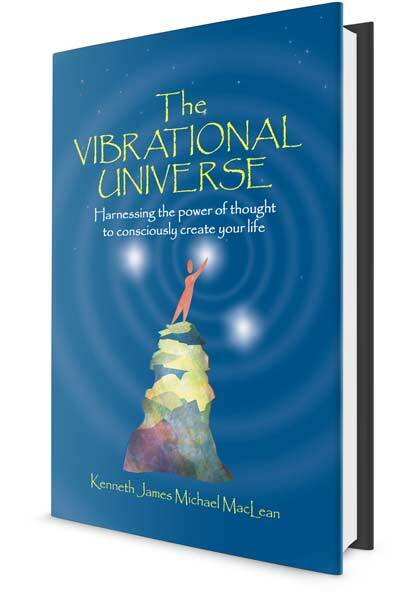 "The Vibrational Universe is one of the best books I've ever read on the law of attraction. Ken explains its principles in a way that anyone can understand and relate to." "I highly recommend this book to people who are really serious about doing the work that needs to be done to regain their personal power." "Ken, you've written ‘my’ book – thank you. All that you are sharing in The Vibrational Universe reflects my life experiences, too – great synchronicity." "I began reading when home recovering from cancer surgery. I have been looking at my life in some different terms since beginning your book. And I continue to evolve in thought each page further. So many of the principles you describe and tenets of those principles truly resonate with me and then I know I am on to something "enlightening." I can't thank you enough for creating "Life's little Instruction Book", which is what I endearingly call your book." Imagine how much better life would be if you knew the rules! The universe has been designed to directly interface with your thoughts and your intentions. Learning to use this interface is simple, and inevitably leads to a feeling of self confidence and personal power. It turns out that there are five fundamental universal principles. All of the others you've read about are subsets of these five. The unexplainable and irrational actions of people suddenly begin to make more and more sense. Where once there was anger and frustration, there is now compassion and understanding. You begin to experience more and more clarity of thought, which leads to greater and greater self confidence. You can't be fooled anymore, because your understanding of LIFE is so much higher. You just feel better about yourself and success seems easily within your grasp. Relationships are easier to attract and maintain, because you understand yourself and others a whole lot better. The Vibrational Universe is a modern interpretation of these 5 fundamental principles, and shows you how to use them in life for greater success and happiness. "Your material beats anything else I have ever read, blending science, spirituality and common sense.. Beautifully written ...."
"I'm a fairly avid reader. I love books that teach me new ideas and things I can use to make me better. What I liked most about Ken's writing isn't the great subject matter, although it is. And it isn't his solid writing style, even though it's wonderful. It isn't even how easily his thoughts flow. What I enjoy most about his writing is he writes from experience. It's a feeling that he's talking about something he's living right now. Something so amazing he had to share it with everyone! And when I read a book written that way, I feel I can have what he has. I can do it and that's empowering." "Thank you. Your life and your work has changed my life. I am truly grateful." The Vibrational Universe may be downloaded immediately after purchase. P.S. The Vibrational Universe is the most content-rich eBook in its field. If you aren't satisfied after reading it, I will give you your money back.